The Big Brother Naija 2018 housemates deny the existence of caucuses but judging by the dynamics, there certainly are. The reshuffle twist Biggie introduced a few weeks ago that saw the unexpected return of Anto and Khloe was definitely just a seed because everything that’s happening in the House right now seems to be a direct result. One such being the evident separation in the House; this is certainly fuelling bad decisions. Afterall, a house divided cannot stand. 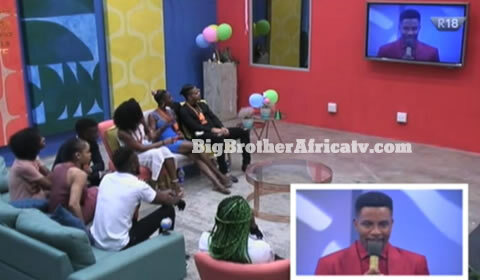 Last night, Ebuka asked the Housemates about the deep cracks on their walls that are slowly leading to the formation of ‘alliances’ and mini preferential groups. This question was primarily extended to Khloe, seeing as she seemed to have highlighted the fact during her conversation with Alex. She seemed to lack direct courage though because when asked to name the members of the ‘caucus’ she had referred to, reluctantly mentioning Alex, Tobi, Miracle and Nina, and claiming that they had straightened it out and were united again. Tobi on the other hand begged to differ, he blatantly named Khloe as the initiator of the separation in the House due to her less than forthcoming management of resources. Furthermore, he believes that they were living in perfect harmony before the ‘Bring Back’ but Anto too was contra. She shifted the blame towards Cee-C, saying that she in fact was the culprit, seeing as she’d cooked for only 5 people, leaving 4 Housemates on the side-lines. This statement was either true or a defence mechanism meant to shield Khloe. In all honestly, there is in fact a prevalence of caucuses, whether the Housemates choose to admit it or not. Classic examples; outside of the Toralex equation, Tobi and Alex have always created their little cocoon where they discussed events and dissected issues in a rather non-communal way. Miracle has limited his loyalty to Nina and Tobi, while Khloe gave good face but seems to only be about Anto and most recently Cee-C; and Cee-C seems to lean towards sides that are at her defence. This list goes on really. It seems as though the Housemates consider this a way forward and as such, we don’t see it ending. Harmony who?